"Made to Order" for Week Thirty Five of My Weekly Creative Challenge! It is time to give a "Hoot"! for my newest creation. This was the second part of a special order I was commissioned to do. My client wanted to have an owl as the main focus of her pendant and this was a first for me. I usually draw the female image as my main focus and this was a definite departure for me. I have to admit it was great fun to create this little "Woodland Creature." She also requested I design custom earrings to go along with her pendant as well. I truly enjoy new challenges and new opportunities. At the time I was designing this pendant, I also drew 3 other concepts for her to choose from, so in the future I might be adding to this series as well. I can't let a good design just sit there on paper only. 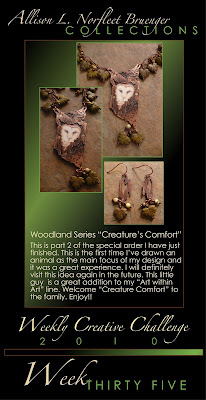 Well it is my pleasure to introduce "Creature Comfort" to the ALNB Collections body of work. Enjoy! Take Care and Keep Creating !